I have recently felt the desire to talk about things that have an impact on our lives that are not just adoption. They are things that can lead to adoption and things that adoptive couples may have lived through. But the topic today is not about adoption. This is an issue I haven't talked about much. It hurts and it's real and I know FAR too many people who have dealt with the loss of a pregnancy. The most recent is someone I went to high school with. We weren't close in high school but I knew of her and her sister. I heard about her loss shortly after it happened and was struck by this picture. Another friend of mine had an ectopic pregnancy with many complications and was farther along than most ectopic pregnancies when they found out. She shared this on her blog. I asked, "What makes a Mother?" When your baby's not with you? But there's no need to stay. I got to come straight here!" 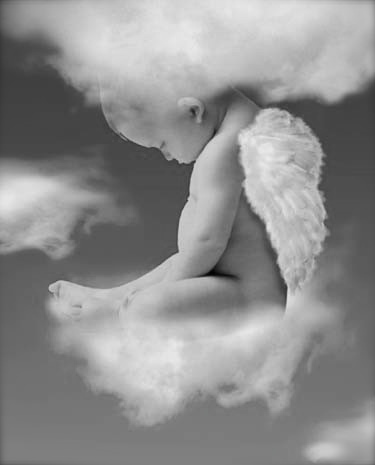 I'm your baby and I am here"
There is no way to heal a broken heart from pregnancy loss. It's a very sensitive subject and shouldn't be taken lightly. Daniel and I have dealt with the pains of pregnancy loss and there is no way to describe the feelings that a mother goes through during that time. I clearly remember laying on the floor pleading that the pain would stop. It was feelings I'd never felt before. I've known the pain of placement. Choosing a better life for my child but in a form loosing them. Never did I imagine that pain I would feel when I would loose my child without a choice. I've often thought of the little babes that were too perfect for this earth. They have a mommy and daddy who love them very much. I can't help but cry when I read the following poem. So there is no need to cry. Just beyond the morning sky. When you could barely stand. And watched her take your hand. Then gave your hand to me. Or see me by your side. While I wiped each tear you cried. A rainbow lights the way. To read more about stories about pregnancy loss you can read Emily and Danielle's story. I went to high school with both of these girls and they truly are amazing women. Thank you both for allowing me to share your story of my blog. These are GREAT resources that can be helpful to many people dealing with this type of a loss.